It is with a heavy heart that we have suffered the loss of Frances, our mother, grandmother, great grandmother, sister and a friend to anyone that has crossed her path in her long journey. Frances is now in peace after a lengthy and courageous battle with dementia. Born in Green Bay, she is the daughter of the late Carl and Frances Brick where she attended St. Josephs Academy. Following her time in Green bay, her family moved to Askeaton, WI where the family farmed raised horses for medical vaccines during the war. In 1958, she married the love of her life Mark Golden (1933-1999) where they established their home in Greenleaf, WI, and raised their four children. She enjoyed working at the general store bringing happiness to all customers that had the pleasure of meeting her. Frances was a care provider for her family and parents and always did it with a smile. She is survived by her children; Tim, Kathy (Stephan), Pete (Ann), Chuck (Tracy). Sisters; Jenny Landry, Carol Diny (Jerry) and brothers Albert Brick and Richard Brick. Grandchildren; Mitch Farrell (Rachel), Sara Golden, Katie Blank (Brian), Polly Jensen (Evan), Mike Farrell (Michelle), Trevor Golden, Catelyn Golden, and Marcus Golden as well as 3.5 great grandchildren. Brothers in law; Tom Golden and Donald Golden. Sister in law; Mary Fulcer (Pete). She was preceded in death by her late husband Mark Golden, Parents Carl and Frances Brick and son Michael. Brother in laws; Raymond and Robert Golden and Harlan Landry. Sister in laws; Germaine Brick, Jean Golden (Bob), Jean Golden (Don), Jane Golden (Tom) and Jackie Golden (Ray). 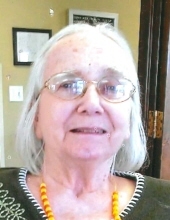 Frances enjoyed being with family, neighborhood activities, bowling, horseshoes, birdwatching, camping and helping others. Friends may call at Ryan Funeral Home 305 N. Tenth Street, De Pere from 4:00PM – 7:00PM on Wednesday November 14, 2018. A prayer service will be led by Deacon Ken Kabat at 6:00PM. Burial will take place on Thursday in St. Patrick’s Cemetery, Askeaton. Please go to www.ryanfh.com to send online condolences to the family. Special thanks to Ledgeview nursing home, Santa Maria, Rennes Health and Unity Hospice through these difficult times. To send flowers or a remembrance gift to the family of Frances (Brick - Golden) Larmay, please visit our Tribute Store. "Email Address" would like to share the life celebration of Frances (Brick - Golden) Larmay. Click on the "link" to go to share a favorite memory or leave a condolence message for the family.